In 1914, Canada was a self-governing dominion within the expansive British Empire. Canada had control over its internal affairs, but none over its foreign policy. When Britain declared war on Germany, Canada was automatically at war. 10th Alberta Battalion training on the Salisbury Plain in Britain (aside Stonehenge). The Canadian government, under Prime Minister Robert Borden, was eager to demonstrate its commitment to the Empire, encouraged by large numbers of recent British immigrants who wholeheartedly supported the war. Voices of dissent were muffled in the flag-waving crowds ready for a fight. Thousands of Canadians quickly enlisted thinking the war would be over by Christmas, provide an escape from the high unemployment in urban centres, and provide the adventure of a lifetime. The first step on the journey to the First World War for Canadian soldiers involved training at Valcartier, a hastily assembled camp outside of Quebec City. Conditions at Valcartier were notoriously chaotic but the experience provided soldiers with basic training. The first wave of 33 000 men bound for Britain left in October of 1914. There, Canadians trained alongside the British under the command of Lieutenant-General Sir Edwin Alderson. Training on the Salisbury Plains, in the shadow of Stonehenge, during one of the wettest years on record foreshadowed the muddy, wet misery that lay ahead for the troops. Hundreds were hospitalized and dozens perished due to both accidents and a wide variety of diseases, including syphilis and spinal meningitis. Recruiting poster, Quebec. Note the monthly pay amount (LAC M#3667127). Canada’s first troops to experience battle were the Princess Patricia’s Canadian Light Infantry (P.P.C.L.I.) who fought alongside the British at the 1st battle of Ypres in December 1914. The remainder of the CEF (Canadian Expeditionary Force) did not arrive to the front from Britain until the winter/spring of 1915. “The whole army realized that it was only the gallant actions of the Canadians that saved Ypres: otherwise one of the greatest disasters in the history of the British Army might have occurred." Though the first Canadians troops on mainland Europe arrived in December of 1914, the first major Canadian engagement was the Second Battle of Ypres, April 22 to May 25, 1915. This battle comprised multiple separate engagements, including the Battles of Gravenstafel, St. Julien, Frezenberg, and Bellewaarde. The aim of the Second Battle of Ypres was ultimately to protect the French and Belgian seaports along the English Channel by maintaining control over the nearest major centre, the city of Ypres, and its surrounding area. The front line pushed into German held territory, maintaining a wide swath of land around the city, creating a bulge, or salient, in the trench line. The Canadian Division was posted in the northeast corner of the salient near the town of St. Julien. A gas attack on the Western Front, date unknown. It was at this battle that the Canadians first faced a new and terrifying weapon of war: poison gas. Next to the where the Canadians were stationed, the 45th French Division of Algerian soldiers were the first to encounter the yellow-green haze of chlorine gas. The gas crept along no man’s land, carried by the wind and followed by German troops in crude gas masks made of chemical soaked towels. Six thousand French died or were incapacitated in the attack. Terrified by the horrors inflicted by the gas, the French troops left alive fled in large numbers, opening a gap in the salient and exposing the left flank of the Canadian Division. At this point in the war, Canadian soldiers were not yet outfitted with gas masks, so troops wetted their handkerchiefs with urine and breathed through the soaked fabric to mitigate the effects of the gas. Luckily, German troops who were themselves hesitant in their use of this relatively new weapon failed to take full advantage of the gap. That night, Canadians mounted a counter-attack at Kitcheners’ Wood, a nearby oak plantation. Hear more about this counter-attack and the story of Lieutenant Russ Boyle of Calgary here. The next day at St. Julien, a small town close to Ypres, Canadians faced a gas attack head on. Despite heavy losses (one in three men became casualties and over 2000 died), the Canadians managed to hang on until reinforcements arrived. The Brooding Soldier, a monument to the Battle of St. Julien, memorializes the spot today. Battle lines: Second Ypres, 22 Apr - 25 May, 1914. Canadian poet Lieutenant Colonel John McCrae was a medic at a casualty clearing station behind the lines at Ypres. He wrote the famous poem “In Flanders Fields,” after the death of his friend Lieutenant Alexis Helmer at the Second Battle of Ypres. Legend has it that McRae initially discarded the poem thinking it was not very good. However, “In Flanders Fields” went on to become a rallying cry for people on the home front during the War. It lives on to this day as a way to remember those who died in the First World War and subsequent conflicts. The Ypres Cathedral in 1917 (LAC M#3403902). The Western Front in 1915 and 1916 with Ypres and Somme labelled. The Battle of the Somme was a slaughter of epic proportions. 1.2 million men were killed or injured, of which more than 24 000 were Canadian, approximately 25% of Canada’s total forces. The Battle of the Somme, named for the Somme River in France, was the first large-scale British attack of the First World War and one that they were not entirely ready to fight. The battle was originally intended to be a joint offensive between British and French forces, but the French were engaged at the Battle of Verdun. Verdun was a symbolically significant location to the French, and the Germans rightly suspected that no expense would be spared to save it. The Battle of Verdun was intended to “bleed them white” according to the German General, Erich von Falkenhayn. In response to the German attack on Verdun, the British hastened their attack at the Somme in order to redirect German forces, a fact that resulted in the use of many inexperienced troops, untested tactics, and a steep learning curve. Captured German trench at the Somme, Sept. 15, 1916 (LAC M#3397786). The first day of the Battle of the Somme, July 1, 1916, was an unmitigated disaster along most of the 34 kilometer-long front line, resulting in 60 000 dead on all sides. The seven-day artillery bombardment that preceded the attack did not have its intended impact despite firing more shells than during the entire first year of the War. Neither the barbed wire of no man’s land nor the German trench system was sufficiently destroyed and German troops had weathered the bombardment safely in deep underground dugouts. This meant that when wave after wave of Allied soldiers were sent over the top into no man’s land, they often became easy targets tangled in wire, or were funnelled by uncut wire into bottlenecks that became kill zones. If soldiers made it across no man’s land, they faced lively German troops, unscathed by the artillery shells and underground mines that exploded beforehand. Somme River battlefront 1916, Beaumont-Hamel shown. Note: Blue= French/British; Red= German. The Danger Tree, a replica of which still stands on the battlefield today, was a frequent target during target practice for German troops and a high concentration of Newfoundlanders met their end here. Of the 801 men of the Newfoundland Regiment, 324 were dead and 368 injured within 30 minutes. While July 1st is a day of celebration in most of Canada, it remains a day of mourning in Newfoundland. As a battle of attrition continued, Canadians took part in a number of other battles on the Somme including at Flers-Courcelette. The Battle of Flers-Courcelette is particularly significant because it marks the first use of the tank– an armoured personnel carrier, but it had minimal impact until later in the war. During its top-secret development, it was described as a “water carrying device” in order to hide its purpose from enemy spies. Early tanks lumbered along at a pace of 5.5 kilometers per hour. The tanks were able to cross barbed wire and trenches, and initially terrified opposing troops. 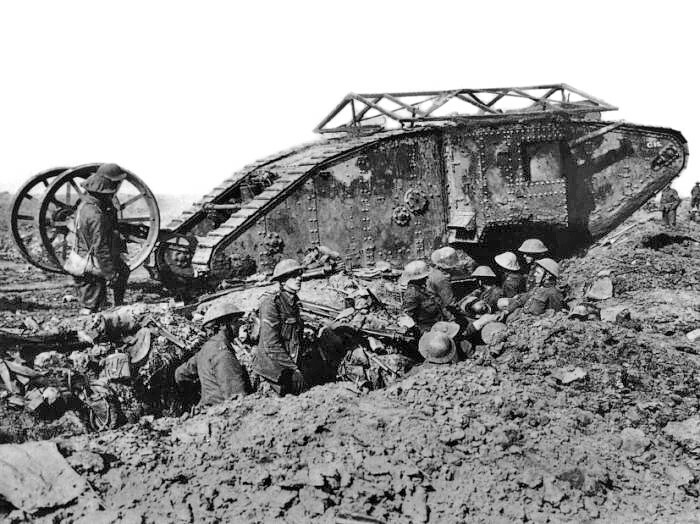 Most of the tanks used during battle either broke down or got bogged down in muddy terrain. Nonetheless, the Battle of Flers-Courcelette was a limited victory for the Allies and the potential value of the tank as a weapon of war was obvious. Thousands more were ordered to be manufactured. Tank technology was honed during the Second World War and tanks continue to serve an invaluable purpose in warfare today. Victorious Canadians near Courcelette (LAC M#3404741). A British Mark I tank, Nov. 1916 (LAC M#3397301). The Battle of the Somme is remembered today for its tragically high human cost. German forces were pushed back during the campaign, but the battle did not break German morale nor result in a breakthrough as hoped, and losses totaled approximately 600 000 on each side. Out of this carnage, valuable lessons were learned by the Allies that would be put into effect at the Battle of Vimy Ridge. The Great War Begins. Dominion of Canada. Canada's Demographics. Sam Hughes. Quiz: Causes of the War. Assassination. Attrition. Schlieffen Plan.